How many phones have you had in your lifetime? I've had six, five of which I grew dissatisfied with and dumped for a newer model within a year, like Hugh Hefner with his wives. Eventually I realized the impact my quest for a socially acceptable phone- from the once-cool slider to the emergence of touch screens- had, not just on the environment, but on people living in countries stripped and mined for technology. My stomach turns to think about the Windows laptops I went through from middle school on, as if they were Kleenex; towards the last day of term they'd break down irreparably, every year, without fail. I now type this on a first-edition Macbook, secondhand, still as fast as functional as ever. You can't say that about many Apple products anymore. Over 135,000 cell phones and 31,300,000 computers are thrown away annually, thanks to upgrades, built-in obsolescence, and prohibitive costs of maintenance and repair. Add this to discarded refrigerators, telephone sets, radios, and other consumer electronics, all with built-in lifespans of five years or less, and we have 384,000,000 electronics being tossed out, not including DVDs and other media. 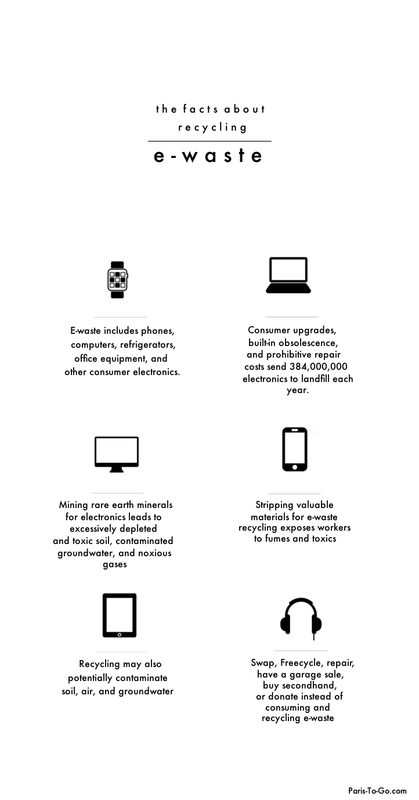 Not only do these electronics contain known toxins, but the mining process leads to social and economic strife and wildlife deaths in countries far removed from us. From Baotou to Hong Kong, China's rare earth minerals are shaping up to be more of a resource curse than a blessing. A report released by China's cabinet reveals that "excessive rare earth mining has resulted in landslides, clogged rivers, environmental pollution emergencies and even major accidents and disasters, causing great damage to people's safety and health and the ecological environment," observed the New York Times. China is a hub of rare earth metals with more than a fifth of the world's rare earth reserves. However, it has depleted its most accessible reserves, transforming minerals into the latest iPad or iPhone. In Mongolia, this resulted in a 10 square km lagoon of radioactive runoff, covering a once fertile area of diverse crops. Sulphuric acid and coal dust coat the countryside, sickening animals and people, ruining fields where watermelon and eggplant once grew. Though the Chinese government has taken notice of the contaminated groundwater, toxic soil, and excessively depleted rare earth supply, local and regional governments still encourage mining. Critics note increasing federal regulation of rare earth mining in China may be subterfuge- simply a means of controlling production and profits while local people struggle to adapt to their degraded environment. Meanwhile, prolific amounts of electronic waste are sent to the so-called "developing" world for recycling, where environmental regulations are weak or non-existent. The "not in my backyard" mentality prevents domestic disposal of neurotoxin-and-carcinogen-laden electronics, so brokers send them overseas, where locals begin the life-threatening task of stripping the valuable metals contained within. These hazardous methods may cause disease and disability due to noxious gases produced by the stripping process. Workers in China, for instance- women and small children- are exposed to dangerous fumes and corrosives exhausted from toxic metals in electronic waste. Besides the social equity aspect, there are separate concerns as to the pollution and toxics involved in e-waste recycling, and the possibility these toxics may leach into soil, groundwater, and streams. Some countries are experimenting with bold federal initiatives aimed at targeting e-waste. In Switzerland, electronics are incinerated to produce energy for clean-burning factories outfitted with scrubbers that inhibit air pollution. This is funded by an advanced recycling fee, or tax, paid at the point of purchase. However, people recycling this waste may still be impacted. Electronics often emit dioxin when burned, which could evade containment methods. Further, mercury, cadmium, lead, barium oxide, and sulfur dioxide are generally present in electronic waste. Barium oxide in particular is absorbed rapidly in the body and can affect the nervous system permanently. The others are known carcinogens or impair neurological development, sometimes causing fatalities due to severe damage in the blood-forming, nervous, urinary, and reproductive systems. Other contaminants expelled during the recycling process include mercury, PCB's, and organochlorine pesticides, which affect fish species and the humans who consume them. Often these toxics are known as persistent organic pollutants, endocrine disruptors to people and animals. The most immediate problem is to health, since emissions caused by the burning of unsalvageable materials, flame retardants, and heavy metals in open fields pollute the atmosphere, releasing carcinogenic compounds into the air. All things considered, what are the implications of the rate at which many countries use and discard electronics? Mass consumption and a throwaway mentality increase the need for overseas e-waste recycling, because all the junk has to go somewhere- but not in our neighborhoods. To mitigate this environmental woe, consumers must buy less, secondhand where possible, and buy better, such as choosing solar panel chargers or plastic free headphones and earbuds, instead of traditional items that only last a few months. A new law in France will force manufacturers to list how long their appliances will last, repairing or replacing faulty items for free within the first two years of purchase (Korea already has extended producer responsibility). Initiatives like Restart aim to educate consumers in basic electronic repairs. Just finished a Marie Kondo-style cleaning spree? Have a garage sale and list items on Freecycle or Craigslist instead of recycling, which should always be a last resort. Garage sales are my preferred method. People paid me for junk, then turned around and upcycled it into something wonderful and useful. Could you give unwanted electronics to someone in need? Make sure any organizations you donate to manage contributions wisely- some companies send items to brokers anyway. My favorite end-of-life-cycle destinations in Paris are the creative resourceries and recycleries. Eco-systèmes and Ou Recycler offer helpful guidance on how best to dispose of appliances and electronics. It also doesn't hurt to browse less, store fewer emails, and use search engines like Ecosia or sites like wwwaste.fr to calculate your digital footprint. Click here and here for tips on how to extend the life of electronics and here for a downloadable fact sheet. Click here to read about Fairphone, an ethical, conflict-free phone designed for longevity and repairability (thanks Anne for the tip!). Arena, J. M. 2009. Poisoning - Toxicology - Symptoms - Treatments. Charles C. Thomas, Publisher, Bradsher, K. China, conceding errors, vows to overhaul rare earth industry. Rare-earth mining in China comes at heavy cost for local villagers. Guardian Weekly. Wong M.H. (2003) Sources, fates and effects of persistent organic pollutants in China, with emphasis on the Pearl River Delta. In: Fielder H (ed) Persistent organic pollutants, The handbook of environmental chemistry, Vol. 3, Part O, Springer-Verlag, Berlin, pp. 355–369. This was a very thoughtful post, and I wish your perspective were more common among bloggers. Because tech has become so integral in our lives, it's easy to look away from the ecological and social penalty that this kind of consumption brings. 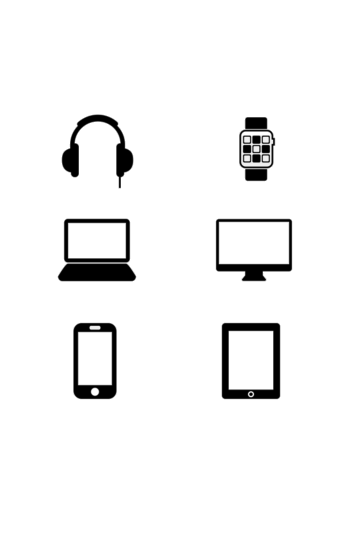 Even with minimalism and simplicity coming into the mainstream, the same cannot be said for our upgrade attitude towards devices. Thank you! After the holidays this year there were so many nice TVs on the curb and I saw boxes and bags of trash with last generation iPhones in them. I think when it comes to zero waste people automatically think tech is the answer and paper the enemy but tech has this massive footprint that we normally don't hear much about. I see infographics encouraging us to recycle them so that new jobs are created but these new jobs aren't domestic, and in some cases it's not adults being employed, it's children. So sad. I remember being a teeny tot and using a TV that my parents had had for the last 20 years. When it finally gave in, the next TV lasted five. I've been stubbornly holding onto my electronics as I haven't really known what to do with them, or resisting the need to upgrade. Id happily use my current phone until the end of my days, but I know it will break down one day despite my desire, the thought of which fills me with rage. Thanks for this post, it's something that should be talked about far more often than it is. I remember that too! I remember trying to dust the top of the TV when I was four years old and it fell on me, TVs were so heavy and bulky back then. But it's true, that TV lasted until college! I hate how phones are designed now so even the most careful users can't change the battery or repair them. I hope manufacturers start to take pride in their work again and think of the quality and useful life of a product rather than the bottom line. There were - ouch! You have my sympathies! "instead of recycling, which should always be a last resort". this is a really important thing that nobody is talking about it. I know it´s importat to build lowsumerism conscience, but its also important to understand that things just dont go away. That is a great point Carolina, about how things just don't go away! There's no such thing as away; it's just hidden from our view and our air and water supply. I think we grew up in the silicon valley revolution. Being an electronics engineer, i saw some of the best innovations ever. Nano technology that out did its previous generations. A transition into 'low power' electronics as opposed to consuming crazy amount of electricity if my dad still held on to this first generation mobile phone from 2000. My old desktop can not run any of the code i write ( Artificial Intelligence algorithms ). Better wireless transmission protocols developed that need more computational capabilities. ... the list goes on. But we are working on more sustainable ways to upgrade. Replace parts instead of throwing out the entire device. Embrace cloud computing as opposed to buying more server capabilities. The more the awareness, the more likely we will spend the money on looking into sustainability as an innovation. As an engineer, its a constant conflict for me to decide when to replace a part vs keep using the lower performance chips. I do mourn the lack of people thinking about the resources used. And the enamour with the new when the 'new' can be done with out / has very little to offer. Great post Ariana! It made me think of Annie Leonards' video 'The Story of Stuff' (https://www.youtube.com/watch?v=9GorqroigqM). I use a MacBook Pro and iPad for my work everyday (my organization requires them and pays for them) but I gave up my iPhone due to carrier costs in the U.S. (outrageous!) I am deeply disappointed with Apple at this point because I just expected a lot more from them from an environmental standpoint. For a company that has been so far ahead of the curve for so long, and so responsible for driving consumer demands and tastes, I find it reprehensible that they have not developed computers, phones, e-readers, etc. that can be repaired and made to last as long as possible. Hopefully they will see the light soon and start changing their business practices (I've got my fingers crossed!). Thanks for your fantastic content and style ~ through your blog I have developed a Zero Waste lifestyle that is more rewarding everyday. My husband's previous job required Apple as well. His digital creative team all use Macbook and he still has his iPhone but he hates it, because aside from the environmental and ethical concerns it's susceptible to hackers. I keep seeing crowdfunding projects to build a better, sustainable cell phone or laptop and they never come to fruition. It's too bad. Maybe the interest or awareness isn't there yet. Wow! I am so impressed your PC laptop lasted so long. Mine never lasted, they got viruses or the black screen of death. I wasn't even playing games or downloading anything or doing anything fun. All I downloaded was textbooks and movies for school :( My sister had a Dell that lasted about that long but every laptop thereafter had a woefully short life. I work in a science lab and every single instrument we use now is connected to a computer. It's such a headache. We're only just getting rid of the last XP machines now. Although by the time the whole company is on Windows7, we'll be needing to upgrade to the next iteration. One of those XP machines is a 2006 Toshiba laptop. IT are amazed that we've made it last this long (it's still fine, we'd continue to use it except that we can't connect to the network anymore). Hi Michelle! Wow what was your secret? Did IT notice anything special that you did to make it last so long? Excellent post, Ariana - as usual! - Is there such a thing as a durable electronic product? Not from any of the big brands, obviously, but perhaps from a more obscure company... Nokia used to make excellent cell phones - I'm still using my 2011 C3. - What practical steps can we take to extend the life of our electronics (laptops and cell phones)? Hi, thank you! At the moment, I'm not sure who is making durable products. This merits more research. But I added two links about how to extend the life of electronics above. Thank you for pointing that out, these definitely belong in there! And the steps were so simple, I was really surprised by some of them- like not touching TV screens to put pixel burnout, or letting cell phone batteries drain weekly. I remember reading a discussion on their site where they expressed their frustration because they couldn't work around the also wasteful practices that come with the Android, windows etc. Their newest version has Android, os they didn't solve it. It's complex. But otherwise they try to be fair to the earth and life on it. My iPhone 3G lasted me for 5 years because I stopped upgrading after ios 4.10 or something. I just use basic apps, mail, dropbox, maps, evernote, youtube. Those were functioning until the end. I confess to owning an up to date iPad. But when that is at the end of it's life I'll decide for a laptop or a tablet (or whatever has been invented by then). And I want my new nokia/windows phone to last at least 3 years, but after reading your article, decided to go for another 5... :-) So thanks for the tips! Thank you for sharing that Anne! What an awesome company. I love their commitment to conflict-free minerals. What about in terms of entertainment systems? Are there brands you can recommend for durability? For instance in a previous article you spoke of people using every bit of trash in Japan. Does the same principle apply to electronics? Curious about the apps on your phone as well. Do you apply minimalism to your Inbox, computer, etc.? Bang and Olufsen is designed for longevity and repairability. The initial investment is higher, but the need for and cost of maintenance is minimized. Plus you are unlikely to replace their products often. We know people who have had their B&o products for twenty years to seven years and even our techie friends, who love having the latest and greatest, remain happy with their purchases despite changing trends. I only have one downloaded app on my phone and two on my iPad. The rest are factory included, and I never use them! I zero my inbox every day and have a small folder of pictures and select documents on my hard-drive, backed up to Google Drive.